Has this ever happened to you? You step outside your front door just to get the mail but your dog goes tearing past you, bounding out of the house and into the street. How about this? Someone comes to your house for a visit and as soon as the door is opened, your dog sneaks by and next thing you know he's roaming the entire neighborhood like he owns it. 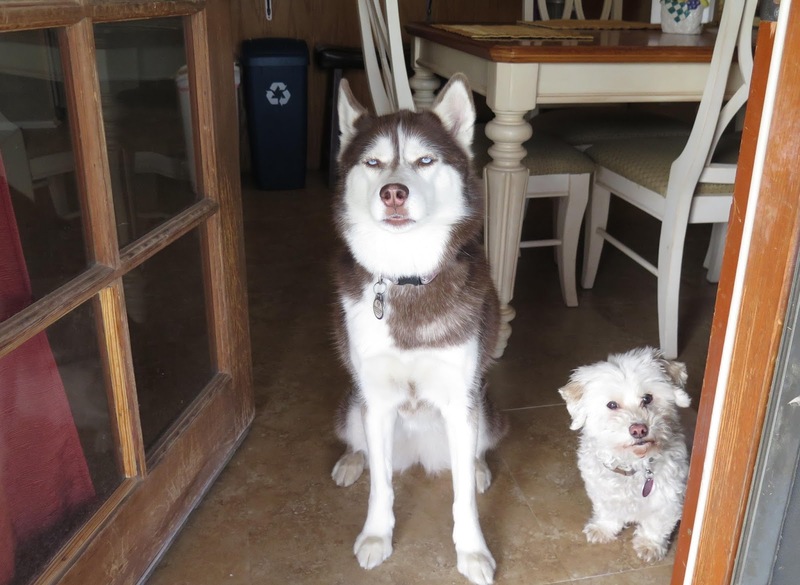 Icy and Phoebe know to wait calmly for us to put their leashes on or to go through any doors. Door dashing, as I like to call it, isn't cute or funny. Your dog isn't just "being a dog" when he barrels past you through a door at lightening speed to get to the outside world. It's a dangerous habit. Many dogs get lost or hit by cars because they've door dashed. How can you stop this behavior? The most effective way for us to ensure our two dogs don't door dash has been to teach them the "Wait" command. Every time my dogs go through any doorway, they know to wait for our command before they proceed. Icy and Phoebe wait at the back door before going out into the yard. We do this for our front door, the back door that leads into our secure backyard, the backyard gate, the car, and even the doors at our local PetSmart. If there's a door involved, they have to look at me or my husband before they go through it. I don't mean to be a drill Sargent, but I know how important it is for their safety. The more the Wait command is a part of their everyday life the safer I know they'll be. On the advice of a professional dog trainer we started putting their leashes on away from the front and garage doors. It helps curtail the excitement they associate with doors and going outside. Start inside the house. Put your dog's leash on just outside a CLOSED bedroom or other inside door your dog uses often. Tell him to Sit and Stay at the door. Staying in front of your dog, put your hand on the door to open it. Your dog may stand up or try to get ahead of you in anticipation of the door opening. Give a firm "Ah! Ah!, Wait!" and make him sit back down. Keep your hand on the door until he settles and looks at you for direction. Slowly begin to open the door. As he tries to move forward, as he likely will, give him another firm "Ah! Ah!, Wait!" and close the door again. Keep doing this until he gets the idea that unless he remains in a sit position and waits for you to lead him through the door, you will continue to close it. You'll probably need to do this a bunch of times before your dog gets it. It may seem confusing to him. How come suddenly Mom or Dad isn't letting me go in that room?? Eventually, he should get it. Once your dog get's it, perform the exercises on other doors over the next couple of days. The garage door, the car doors, the backyard door, and so on. He'll eventually learn that he needs to check in with you before he's allowed to go through a door. However, if you can't seem to teach the Wait command successfully, get some hands on help from a professional dog trainer. Has your dog ever door dashed? How do you prevent your dog from dashing out into the street or other dangerous situation? We love to hear from you, please leave us a comment and share your thoughts with us! Excellent post on a very important topic! 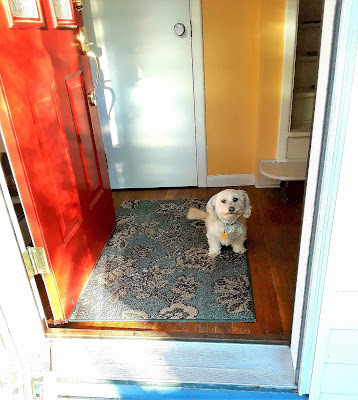 We taught our pups the same, exact manners: They wait at every door for our ok to proceed (front door, garage door, patio door, doors we encounter on social outings). Humans always go first, then the pups follow CALMLY ~ there's no dashing through! Exactly! Waiting at doors is a good safety habit. Thanks for visiting the blog today! Great post! Teaching wait was one of the first things I taught my girls when they came home! We've never had an incident of door dashing. I agree with you that it's extremely important to teach it! Excellent! It really is an important safety command. Thanks for visiting the blog today Lauren! This is a great way to prevent unnecessary heart break! Phoebe and Isis look like little angels waiting so patiently. The Wait command is so useful and I taught Haley this same way. It's especially handy for me when I take Haley in the car. Having her wait when I open the car door and put on her leash makes it much safer than if she was anxious to jump out of the car. Such great advice!!! All our pups know the wait command,and it sure does come in handy! The "wait" command is HUGE in our house!!! I think if it wasn't for that, I would have lost my huskies a million times by now! Donna Hill has a great training video on this subject on youtube. Excellent advice! As you noted, consistency is important for teaching your dog to always wait for your direction before he goes through any door. Great tips! We use wait with Charlie too! Any strategies to keep the cats from door dashing?! This is great! I only have one dog who will sort of take off and we have a double door system so she doesn't. I think I will start working on this with her... thanks for the reminder! I am so glad Laika isn't a door dasher - growing up we had a Lab that was famous for this and it was a pain. Luckily we always managed to get him back in but it's a recipe for disaster. I'm so glad "wait" is one of the first things I taught Laika this time around. Great advice. It's not the most obvious command to teach,but it should be one of the basics. There are so many uses for it. That, along with "leave it" have been invaluable for me and my dogs! I'm going to remind my son to teach "wait" to his puppy Zeke...who has no idea of the concept! I know, right! When we adopted two new dogs…they had no idea that they should do this. So we had to teach em - momma worked with them over and over and over! Great material in your post - thanks for sharing! Great tutorial! Reese is better at recall than Henry so we do our best not to be in that situation. They 'wait' at the top of the stairs when we're at the door. Well, back legs anyway! We've been working on teaching Felix and Kol this, as their first instinct is always, ALWAYS to make a mad dash for whoever is visiting and pounce on them like Tiggers. Thanks for the tips, I'll definitely give it a try! 'Wait' is a command we work very hard on. Mauja and Atka do pretty well with waiting when someone opens the door. We also use this for car rides. They know that an open door doesn't mean they can exit the vehicle. I used wait for my dogs too and it works so well. Now if I can just get my cats to learn it :-) actually I don't have a doro dasher now but I sure have in the past! Ty for sharing these tips. We have gates in place, too, and even though Dex is good on recall, it is fabulous to see these ideas. Luna does an excellent wait and stay because we practice so often for photo shoots. She does need to work on her recall though! I absolutely agree with the importance of this training! My coonhound is the first dog I have had that is a door dasher and quite worrisome since I know he will allow his nose to lead him astray for Lord knows how long. I do not use the 'Wait' command, however, I do prepare him for going to the door from the far side of the room where he is fairly well trained to sit and stay and then when released knows to stop at the door. We have both come a long way in 3 months! When they were younger Davinia and Indiana would door dash. Thank goodness the first time Indiana did it we lived in an apartment complex so she didn't get far but she did wind up in a neighbors apartment! She did it another time when the mailman came to visit. This time we were living in a house thank goodness she stayed in the front yard and never made it past the gate. Maybe Davinia never made it out the door because I knew she would run and not stop to smell the flowers or visit friends. Wait is such an important command - it is one of the first things I taught Boca when she arrived from The Bahamas! Thankfully, Rooney just wants to see who is at the door and never really wants to leave the house. Thanks for the valuable feedback. I think that strategy is sound and can be easily replicable. I want to get more information can you please add more things? Buy Cat Bowl at guaranteed cheapest prices with free delivery available now at The Loving Bowl. The Loving Bowl designed all type pot relate dog. We had a Yorkie when I was a kid and she dashed out the door a few times, thankfully, we were always able to find her and get her home safely. The dogs I have now don't typically try to dash out the door, but it only takes one time to have a disaster. I'm going to try this technique with my dogs. Thanks! It's so true, it only takes one time to have a disaster that could cost your dog dearly! Thanks for stopping by! He'll go into our outside hallway if we have guests coming in but otherwise he doesn't really door dash. He's always ready for adventure but he wants me there too! "Wait" is such an useful cue though. I use it all the time. 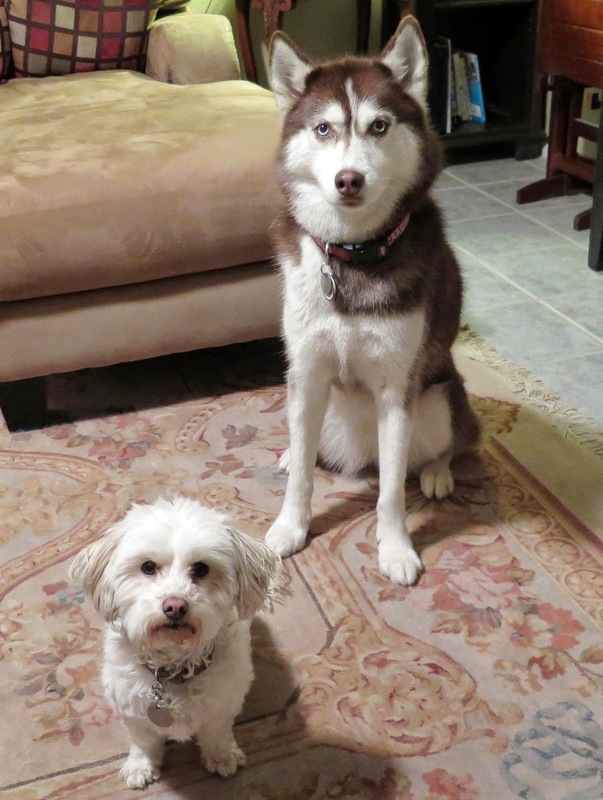 WORDLESS WEDNESDAY: Pets Need a Friend! Black and White Sunday: Hungry Like the Wolf!